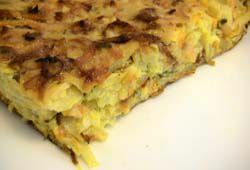 Potato kugel may get all of the attention, but if you're looking for a lighter, more colorful option, Giora Shimoni's Vegetarian Vegetable Kugel is a nice alternative. Shimoni adds zucchini, carrots, and onions to the usual potatoes, but feel free to experiment with other favorite veggies. If you want to adapt the recipe for Passover use, substitute matzo meal for the flour, this kugel is a favorite among vegetarians who keep kosher for Passover. Preheat the oven to 350 F. Oil a 9x13x2-inch baking dish or similarly sized casserole. Using a box grater or a food processor fitted with a shredding disc, coarsely grate the potatoes, zucchini, carrots, potatoes, and onion. Transfer the grated vegetables to a large mixing bowl. Stir in the garlic and parsley or basil. Add the eggs and olive oil, and sprinkle evenly with the flour. Mix well. Pour the vegetable mixture into the prepared baking dish. Bake for 45 to 60 minutes, or until the vegetables are tender, the kugel is set, and the top is browned.